As we’re nearing our six-months-to-go point, I have amassed a list of places and things that I want to see in Kuwait before we depart. However, I did this with some trepidation. The last time I did our six-months-to-go list was on January 25th, Police Day in Cairo, and what officially became the first day of the Egyptian Revolution in 2011. Six days later, I was evacuated out and separated from my husband and our kitties for three months. But, feeling that I couldn’t live in fear forever, I made up our Kuwait list and have posted it on the fridge for all to see. Admittedly, I realize that the majority of these are probably of very little interest to my husband – for example, the Sha’ab Duck Park he could probably live without seeing, and the Japanese Gardens he might forego, as well. However, I did give him the chance to review the list and tick off any things he’d like to see, and surprisingly he actually chose a handful; which have been duly noted for future weekend family excursions. So, always wanting to start checking things off a list, I suggested we head out for a few hours and start seeing the sites! Our plan was to visit the Kuwait National Museum and the Sadu House, located right next to each other, and providing there was time, maybe head out to the Sulaibikhat Nature Reserve. The Kuwait National Museum supposedly contains a Heritage Museum, an Archeological Museum, a Planetarium, and an old traditional Kuwaiti house (from pre-skyscraper days). The bemusing thing about this, is that the building itself is tiny; at least to hold all that. But the bottom line is, that we cannot prove or disprove any of these claims because by the time we got there, they were closed. Or quite possibly, they were never open. For whatever reason, our GPS that morning decided to take us in the complete opposite direction (it was only 4 miles from our house) and plunked us down in car-parts alley instead. So, thanks to horrendous traffic, an hour later we had done a big loop, passed our house again, and drove the four miles up the Gulf to the museum; and it was closed. But, next to it was the Sadu House, and it was open. The Sadu House is an old-fashioned Kuwaiti house. It was originally built in 1936, and was the first house in Kuwait to be constructed using stone and concrete. It was built in the traditional style, with open courtyards with rooms jutting off like flower petals. Twenty-five years later, the government of Kuwait bought the house in order to preserve it for its historical significance. 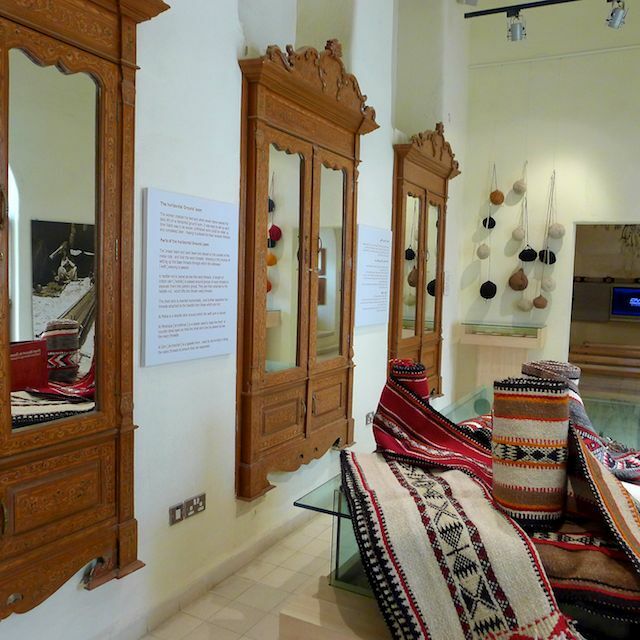 The house is currently used as a cultural center, with speakers and presentations, as well as housing a permanent exhibit on the history of Bedouin weaving. 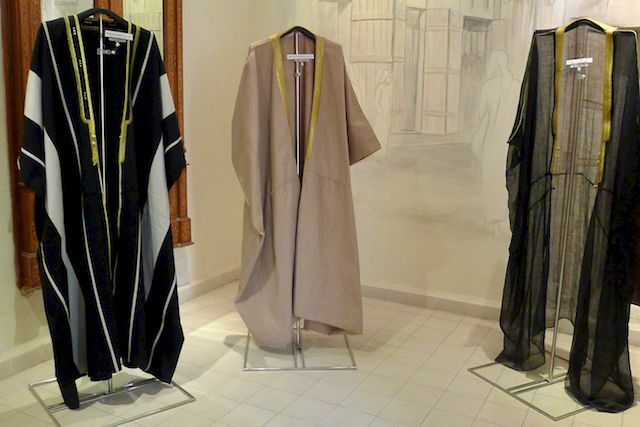 “Al Sadu” is a Bedouin term, referring to traditional desert weaving done on a horizontal loom. The house also has some of the original wooden doors from Karachi, Pakistan and ornate iron windows; the details and designs on the doors are really stunning. While we were walking around the exhibits, they were setting up for a speaker in the main courtyard for that evening. They invited us to return, but we thanked them and declined the offer. My husband was probably just hoping to return home, but I still had designs on heading out to the nature reserve. I dragged Bean along one day. And when I say “along”, I really mean a loooooong. We must have driven for three hours (luckily she slept most of the way). And once we left Kuwait City proper, and passed the Shuwaikh Port where all the container ships dock, we were in traffic-construction hell, which accounted for the drastically delayed progress. While dodging traffic cones, we passed Kuwait University, a whole pile of specialty hospitals, a falcon veterinary hospital (falconry is very popular here), and even Entertainment City (I’m assuming the sign was being ironic). I had mistakenly hoped that there would be a) a sign saying, “Nature Reserve, This Way”, and b) that it would be in English. I was wrong, on both counts, and I finally relented and turned around and headed home. Not ready to fully give in, I told my husband that we needed to use the GPS function on his smart phone so we’d know exactly where to turn. And somehow I managed to convince him to head that way following our foray at the Sadu House. Unfortunately the endless road construction was still a factor, so we got some concerted family time in the car as we puttered along following our little blue triangle on the smart phone. As my husband was watching our progress on Google maps, he said with just a little concern, “I had no idea Basra was so close!” In actuality it’s about 80 miles, but he made it sound like we might swing by for tea on our way home. Despite our alleged immediate proximity to Iraq, and our lack of passports, using Google maps and the GPS, we found it! We turned at the correct intersection, just passed all the hospitals, and there, located directly behind the Kuwait Ministry of Health was a sign (in Arabic) saying “Nature Reserve” positioned in front of a rusting chainlink fence that corralled knee-high dead grass, three trees, and bunch of trash blowing in the wind. We parked, got out and verified the sign, and then laughed until we cried. So much for my nature needs. Now, in all fairness, the “nature reserve” part could be the shoreline, which we could not see from our vantage point. I did note that there appeared to be large white somethings floating in the water in the far distance. They could have been birds or just plastic bags, but until proven otherwise, I’m going with the former. So, we took a few pics to prove we were there, fed Bean her bottle, changed her diaper, and dove back into the traffic mess and headed home. “So we can only see things that others have discovered? Where’s your sense of exploration and adventure?” I asked. He didn’t reply, but I swear I heard him mutter something about his idea of adventure not being quite so close to the borders of Iraq.